The K-300 is a 122cm traditional upright, with subtle contemporary design touches, and is one of Kawai’s best-selling pianos. It is a perfect upgrade from a digital piano, and great for inspiring players of a wide range of abilities. It offers numerous advantages over the smaller K15E featured in this guide, particularly in the additional depth of tone offered by the larger soundboard and longer strings that the greater size affords. The K-300 benefits from the upright version of Kawai’s Millennium III action, which combines traditional wood with light, strong ABS Carbon parts to provide a responsive and involving playing experience. It has extended key lengths over the smaller models in the range, providing further enhanced control. The sound combines the depth of tone commonly associated with Kawai uprights, with a clarity that makes playing intricate textures a delight. On a practical level, there is a slow-fall mechanism to prevent trapped hands, and a well-sized music desk to accommodate your sheet music. An ATX2 hybrid version is also available for £6,888 (RRP) in ebony polished or £7,333 (RRP) in white or mahogany polish. 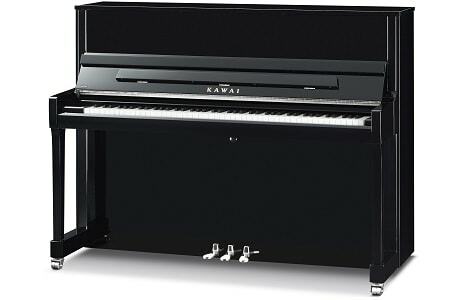 This combines the full acoustic K-300 with digital connectivity and an option to practice privately with headphones offered by Kawai’s Anytime X2 system. All variants are also available with silver fittings instead of traditional brass for a small premium.